This is Ranger at 3.5 months! This photo was taken at the Stellako River during our vacation this year. We had just climbed to the top of this large hill to see the view and he laid down (he ran about 5 times as far a we did bouncing over logs and really tall grass.) This photo is too cute not to share. 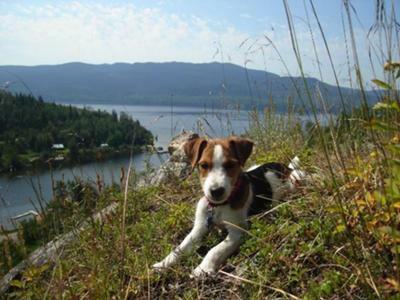 Ranger was your typical fun loving, photogenic and great Jack Russell. His favorite activities were playing and eating socks! He was an amazing puppy with tremendous potential. He ate a poisonous plant and died at the age of 4 months.